Exceptional quality colored diamonds are rare and extremely expensive. However, naturally dark or tinted diamonds can be irradiated to create a more pleasing, uniform color. Modern irradiation practices leave diamonds vibrantly colored and non-radioactive, creating beautiful options for gemstone collecting and jewelry. Once a diamond has been irradiated it becomes very sensitive to heat, so jewelers need to take care when using a jeweler's torch. Diamonds can have naturals, naturals with trigons, bruted girdle surface if not faceted, bearding, sharp facet junctions, angular mineral inclusions, olivine, garnet, diopside, graphite mineral inclusions, parallel growth marks, color zoning, internal grainingRed irradiated diamonds will have an even distribution of color but might show color zoning associated with the facets. In blue stones the color is usually even but can be uneven with blue and colorless zones. Might show facet-related color zoning or color at the culet. 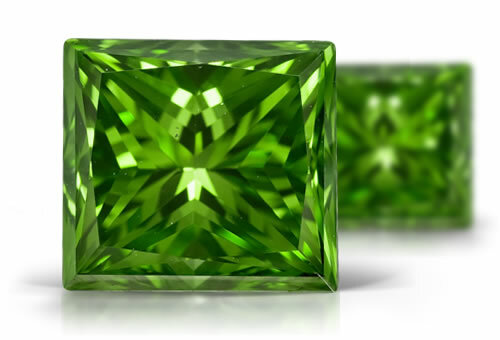 Green stones show distinct color zone around the culet in a "umbella" pattern and color zoning that follows the facet junctions.